Film review by Claire Durrant of the comedy Hail, Caesar! starring Josh Brolin as a Hollywood ‘fixer’ who has to juggle a number of cinematic disasters, including the kidnapping of a leading man (George Clooney). 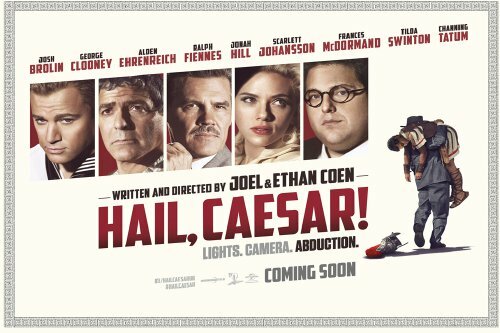 Hollywood “fixer” Eddie Mannix (Brolin) is called in to action when the lead of the upcoming epic film Hail, Caesar, Baird Whitlock (Clooney) is mysteriously kidnapped by a group of people calling themselves ‘The Future’. But that is only a small subplot to Mannix’s problems. 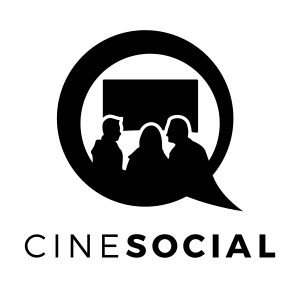 Set in post-WWII Hollywood, the film’s central focus is a day in the life of Eddie Mannix, whose job is essentially to fix the problems that might destroy the reputations of those working in the film industry, should the press be notified. And in that day the film concentrates on Mannix, who has an abundance of issues to tackle. The aquatic actress DeeAnna (Johansson) is pregnant and has no intention of marrying the father. There are problems depicting Christ in the Hail, Caesar without offending any religions. Mannix has to represent Hobie Doyle (Ehrenreich) as he makes the difficult change from Western star to a romantic lead, much to the disdain of the pompous auteur Laurence Laurentz (Fiennes.) As well as keeping the news of Whitlock’s disappearance from twin rival columnists (both played by Swinton) and dealing with his own problems of trying to quit smoking and debating whether to take a new job. As you can tell, there is a lot going on in this film! In true Coen style, the narrative is loose in structure. What we get is a true love letter to the Golden Age of Hollywood. The fun of watching Mannix travel from one studio set to the next is that we get to see beautiful pastiches of the films and the studios of the fifties. The stand out scene for me was the musical number in which Channing Tatum’s character laments that he isn’t going to see “No Dames” while he’s at sea. The long sequence of music and tap dance screams Gene Kelly. In fact, some of the dance moves took me back to the “Moses Supposes” scene in Singing in the Rain (1952). Tatum has one of the best (albeit brief) performances of this film. He was overly dramatic which evoked some of the humour the film had to offer. Tatum has proven himself to be one of those actors who are just about up for anything. Zac Efron should take notes. Josh Brolin is also a great as a leading man, a mixture of charm, pitifulness, and a film noir detective-like demeanour. But Alden Ehrenreich gets the golden star for best turn. Hobie Doyle is simply adorable! Wanting to please everyone and struggling to adapt to talking on film rather than riding a horse creates one of the most memorable scenes of the film; the outtakes of him saying his first line in the film the character is starring in. Laurentz is directing him to talk as a thespian, which is difficult considering Hobie’s southern accent. The impatience of Fiennes as his tolerance drops, juxtaposed with Ehrenreich’s innocence, is amusing to see unfold. Yes, a part of me is gutted that this film did not focus more on Brolin uncovering Baird’s disappearance (in a somewhat comedic neo-noir tone), but the inside jokes about Hollywood are enough to amuse any cinephile. I’m sure some people will not enjoy the unfulfilled story, but if you enjoyed films such as Altman’s The Player (1992) as well as the Coen’s previous film Barton Fink, you will also like the satirical comedy of Hail, Caesar. Directors: Ethan Coen, Joel Coen. (106 mins). Mike Zoss Productions, Working Title Films. Producers: Tim Bevan, Ethan Coen, Joel Coen, Eric Fellner. Writers: Ethan Coen, Joel Coen. Josh Brolin, George Clooney, Alden Ehrenreich, Ralph Fiennes, Scarlett Johansson, Tilda Swinton, Frances McDormand, Channing Tatum, Jonah Hill.